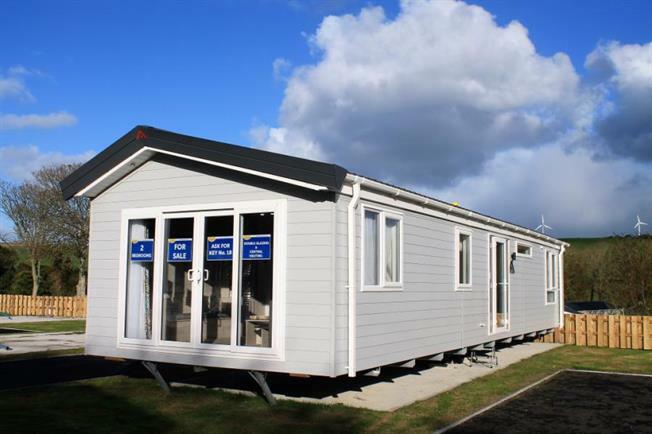 2 Bedroom Detached Mobile Home For Sale in Newquay for £78,848. This new 2019 43' x13' Atlas Ovation two bedroom luxury holiday caravan, with bathroom and en suite shower/cloakroom is available at Newquay View Resort, located just a mile away from beautiful Porth Beach, near Newquay in Cornwall. Newquay View Resort is open for 12 months a year so there is no restrictions on when you use your holiday caravan. This ever popular two bedroom model is perfect for the family or those wishing to sub-let their holiday home. With uPVC double glazing and LPG central heating it is perfect to use what ever the weather! One double room, one twin room and a double guest bed hidden in the seating area means that this holiday home will sleep up to six people. Come and see why people come back to Newquay View Resort time and time again.